Scooper - Technology News: Are we about to witness the end of Guinea worm? Are we about to witness the end of Guinea worm? 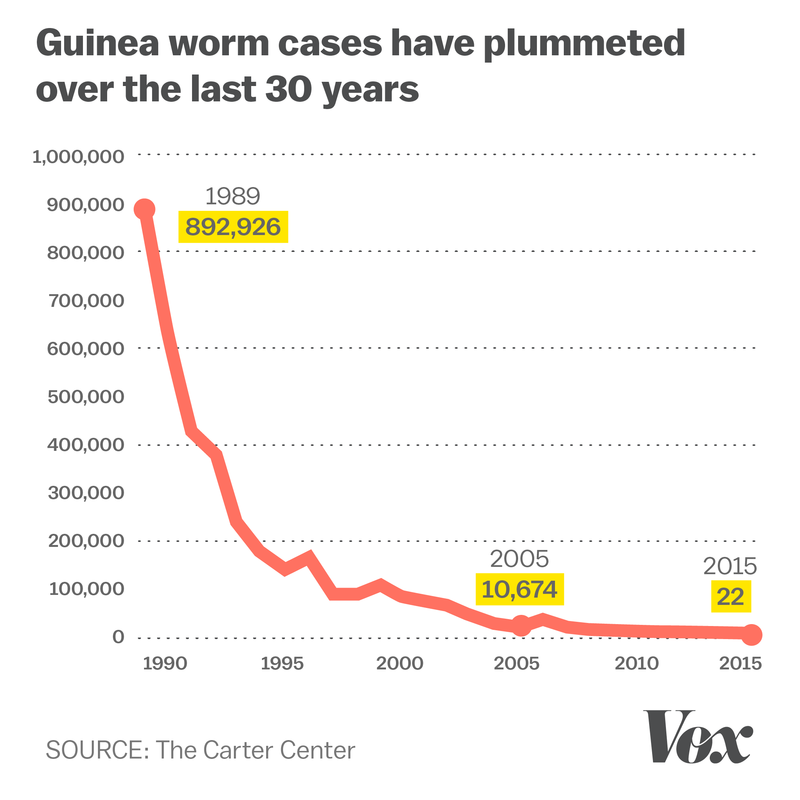 2015 was an amazing year for Guinea worm eradication. Globally there were only 22 cases of this debilitating infection, down from 3.5 million at the start of the global campaign to eradicate the disease, just thirty years ago. Even compared to 2014, this was a dramatic drop: an 83% decrease from the 126 cases reported the previous year. There is no vaccine or easy cure for this painful parasitic disease, which spreads through water contaminated with larvae, and no drugs to treat it. The only way to get rid of the worm is by slowly and painfully pulling the worm out from where it emerges through an ulcer in the skin, over several weeks. The disease doesn’t usually kill, but it disables and weakens people, making it harder for them to support themselves. Making progress against Guinea worm has taken political leadership, hard work, and low-tech solutions, including distributing water filters and mass education about healthy behaviours to stop the worm’s spread. No country illustrates that success better than South Sudan. The extreme poverty and ongoing political turmoil and conflict in the country once had it poised to be Guinea worm’s last haven. But thanks to political commitment and the dedication of health workers, South Sudan decreased cases from 70 in 2014 to just 5 in 2015, and is on track for success. For me personally, the year held two highlights. First, I was able to meet the last person to suffer from Guinea worm in in Ghana, which was certified Guinea worm-free in 2015. She and her young son were both infected. For her, the Guinea worm wrapped around her ankle, which has left her with a permanent deformity – a reminder that our approach to neglected diseases must include support for those left with disabilities. She remains strong, however, and hopeful for a better future for her family, free from the threat of Guinea worm. The second inspiring moment for me was the news that former U.S. president Jimmy Carter appears to have overcome cancer , and will stay in this fight. President Carter has made championing Guinea worm eradication a central part of his post-presidency, and the Carter Center he founded has been at the forefront of the global eradication campaign since it began in 1986. This is a moment that deserves celebration. But major challenges remain before we can rid the world of Guinea worm forever. In addition to South Sudan, the parasite remains in Mali, Ethiopia and Chad, each of which poses unique challenges related to insecurity, political commitment and the remoteness of affected districts. In Chad, there is increasing evidence of Guinea worm infection among dogs, which might be contributing to new human infections. In 2016, we need to apply successful approaches to overcome ongoing transmission and tackle new challenges. I’m confident we’ll get there: all partners are working together to untangle this challenge and help the programme succeed. We know we can succeed in challenging circumstances, and we’re constantly moving forward. In Mali, despite ongoing instability, the program reached more villages than ever before last year. I’m confident that with a global commitment to work through the remaining challenges, 2016 will be another great year.